Your Hyundai is equipped with a day/night inside rearview mirror. The "night" position is selected by flipping the tab at the bottom of the mirror toward you. In the "night" position, the glare of headlights of cars behind you is reduced. Automatic dimming rear view mirror controls automatically the glare of headlights of the car behind you when it turned on by pressing and holding the button for more than 3 but less than 6 seconds. It is turned off by pressing and holding the button for same time once more. Press and release the button, then the vehicle's directional heading will be displayed. Pressing and releasing the button again will turn off the display. ex) NE : North East. Press and hold the button for more than 9 but less than 12 seconds. When the compass memory is cleared a "C" will appear in the display. - Driving the vehicle in a circle at less than 5mph 2 times or until the compass heading appears. - Driving in a circle in right-handed direction and opposite direction are possible, and if the calibration is completed, the compass heading will appear. - Keep driving in a circle until a compass heading appears. 2. Press and hold the button for more than 6 but less than 9 seconds. The current zone number will appear in the display. 3. Press the button until the new zone number appears in the display. After you stop pressing the button in, the display will show a compass direction within a few seconds. Due to mirror positions being angled towards the driver, the compass mirror can also compensate for drivers seated on the Left Hand side of the vehicle (steering wheel on the LH side of the vehicle) or Right Hand side of the vehicle (steering wheel on the RH side of the vehicle). 1. Press and hold the button for more than 12 seconds. 2. Release then press the button to toggle between “L” and “R”. This procedure also causes the compass to be de-calibrated. 3. To re-calibrate the compass, drive the vehicle in 2 complete circles at less than 8km/ h (5mph). 1. Do not install the ski rack, antenna, etc. which are attached to the vehicle by means of a magnet. They affect the operation of the compass. 4. When cleaning the mirror, use a paper towel or similar material dampened with glass cleaner. 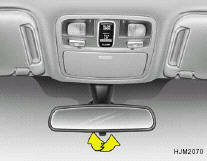 Do not spray glass cleaner directly on the mirror as that may cause the liquid cleaner to enter the mirror housing.